Higher Wages, Lower Prices Give Consumers A Break Something very unusual is happening in the U.S. economy. Traditionally, workers lose buying power to rising prices. But lately, paychecks and prices have been heading in opposite directions. 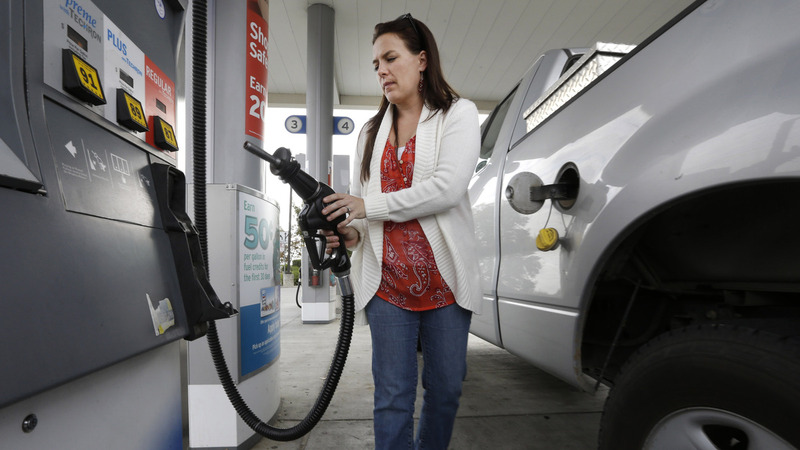 A sharp drop in gasoline prices led the consumer price index to fall in January. The CPI posted its first year-over-year drop since 2009. Economists usually worry about a "wage-price spiral" taking hold. That's when workers are earning more, but losing buying power as prices rise. For now, at least, something very rare is happening: Paychecks and prices are heading in opposite directions. "You have a schism that's helpful to consumers," IHS economist Doug Handler said about the recent decline in prices and rise in wages. New evidence of that divergence appeared Thursday when the Bureau of Labor Statistics' consumer price index showed that retail prices fell by 0.7 percent in January — more than double the drop seen in December. Retail prices seldom fall, and when that happens, it most likely means the economy is in trouble, as it was in 2009 when the CPI last posted a year-over-year drop. But today's retail-price declines are coming just as wages are nudging higher and the economy is growing. Oil Price Dip, Global Slowdown Create Crosscurrents For U.S.
"It's a Goldilocks situation," Handler said, meaning the economy is running neither too hot nor too cold, creating an opportunity for wages to rise while prices lag. The most recent BLS monthly jobs report showed average hourly earnings increased by 12 cents to $24.75, up 2.2 percent compared with last year. But in the past year, the CPI has declined by 0.1 percent — marking the first negative 12-month change since the period ending in October 2009. Remember: In October 2009, the unemployment rate was 10 percent and the economy was flattened. The drop in consumer demand during those tough times pushed down prices. Now the causes of the CPI decline are very different. The main factor today is the plunge in oil prices, tied to a surge in production. The BLS gasoline index fell 18.7 percent in January, the sharpest in a series of seven straight declines. But there are other factors restraining price increases as well, such as a stronger dollar, which makes imports cheaper for Americans. Here's another reason: Crude oil, corn, cotton, copper and many other commodities are much cheaper than a year ago. The most recent producer price index declined 0.8 percent in January, the fifth decrease in the past six months. Thanks to cheaper transportation and commodities, the CPI showed the price of home-cooked meals fell by 0.2 percent, the first drop since May 2013. This price relief is coming at the very time when millions of workers are getting raises. The Economic Policy Institute, a liberal research group, says in a new report that the lowest income earners got raises that outpaced inflation last year "because of minimum-wage increases in 2014 in states where 47.2 percent of U.S. workers reside." In addition to these forced wage hikes, some employers, including Wal-Mart, T.J. Maxx and Starbucks, recently have announced raises for hourly workers. Meanwhile, organized labor is becoming more aggressive. Unions representing West Coast dockworkers recently staged work disruptions and oil-refinery workers are on a widening strike. Tim Canoll, president of the Air Line Pilots Association, said that with cheaper jet fuel and a stronger economy, airline workers are hoping their contracts will soon make up for lost years. "There's going to be a good deal of raises," he predicted. Daniel Davis, a software engineer in Washington, D.C., says he has been enjoying this rare, good groove of increasing pay and decreasing prices. "Wages are rising for us," he said, referring to tech workers. At the same time, "I've noticed the gas [prices] going down." Davis' bottom line: "The level of comfort for buying personal things has gone up." He said his recent splurge of choice was an expensive sports watch. But so far at least, many Americans don't share Davis' confidence. After years of too much debt and almost no wage growth, they may need more time to get in a shopping mood. Jack Kleinhenz, chief economist for the National Retail Federation, said in a written analysis that January sales growth came in weaker than expected. "Extra money coming from lower gas prices may be going toward savings, paying off debt or spending on services rather than retail goods," he said. Handler, the IHS economist, predicts that as more wage increases kick in, more people will go shopping. Then, as labor costs rise and consumer demand strengthens, retailers will start to bump up prices again. The current uncoupling of wage and price movement "won't persist indefinitely," he said. But after so many years of taking a beating, workers might appreciate it if Goldilocks could get comfy in that just-right chair and settle in for a while. NPR business desk intern Caele Pemberton contributed to this report.